Bonafide is a nice little and independant magazine based in the UK, available online and at selected retailers. They focuse on music, art and lifestyle. Their 2nd issue from 2009 included an excellent Mo’ Wax feature with an interview with Gareth Bayliss, one of Mo’ Wax former designers. Check it out! 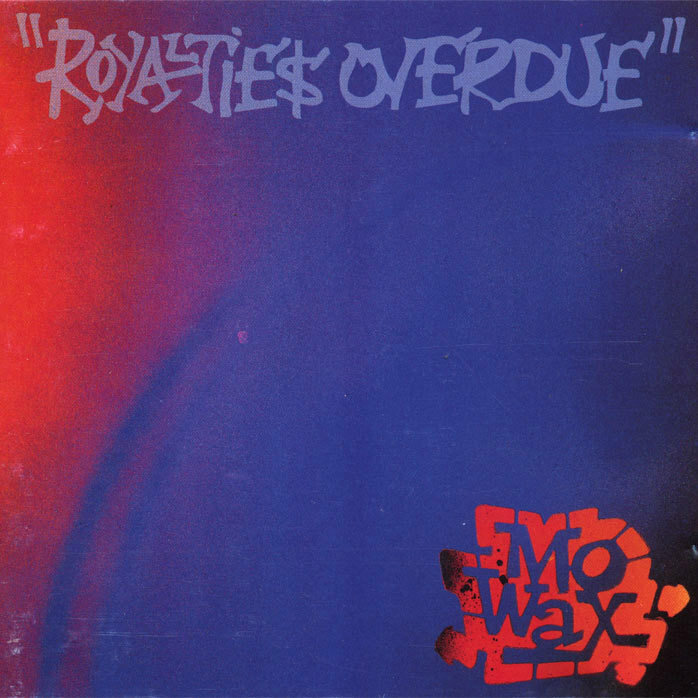 Mo’ Wax was a UK label dedicated to experimental sounds. Their open minded and creative approach was evident in their ambitious and extravagant artwork. We examine the work they curated and speak to Gareth Bayliss, a fan turned employee at one of the most individual record labels ever run. In issue 01 we provided a history of record sleeve artwork. We talked to Ehquestionmark and George Dubose, two contrasting individuals who have pushed art direction for record sleeves to another level. The feature tried to present an overview of how different labels, in different decades, have influenced the visual identity of music. We discussed the Factory Records and Peter Saville partnership in the 1980s and the ongoing collaboration between Lex x Ehquestionmark. On a timeline, Mo’ Wax is situated in between these luminaries, and its lasting contribution to music design deserves to be explored. The similarities between the three labels are striking. Each label had an agenda to release boundary pushing music. Each had recognisable figureheads. Factory had Joy Division and New Order, a charismatic owner in Tony Wilson, and worked with a designer, Peter Saville, who made Factory visually iconic. This potent mix created the Manchester scene and influenced national popular culture. Fast forward to 2009 and Lex are putting out groundbreaking work by musicians such as Danger Mouse and Neon Neon and with Ehquestionmark, are producing stunning music packaging. In the following pages we will sketch out, with the help of former Mo’ Wax designer Gareth Bayliss, why the label’s approach made it one it visually illest, ever. Mo’ Wax was started in the 90s by a teenage James Lavelle. With a taste for cool matched by a DIY attitude, Lavelle embraced music, fashion, film and art. Bringing together a roster of international talent he created an aesthetic that made Mo’ Wax define especially in London and Tokyo, street cool. The heads Lavelle networked with is a Who’s Who of cool: musicians such as DJ Shadow, Solesides/Quannum, David Axelrod, Dr Octagon, Air, Major Force, and Pyschonauts; producer Tim Goldsworthy; promo-makers Jonathan Glazer and Shynola; streetwear freaks Nigo (BAPE), Hiroshi Fujiwara (GoodEnough) and heads at Stussy and Gimme-5; artists such as 3D (of Massive Attack), Futura 2000, Haze, Mike Mills, Stash and B+; and designers such as Ben Drury, Swifty and Will Bankhead. 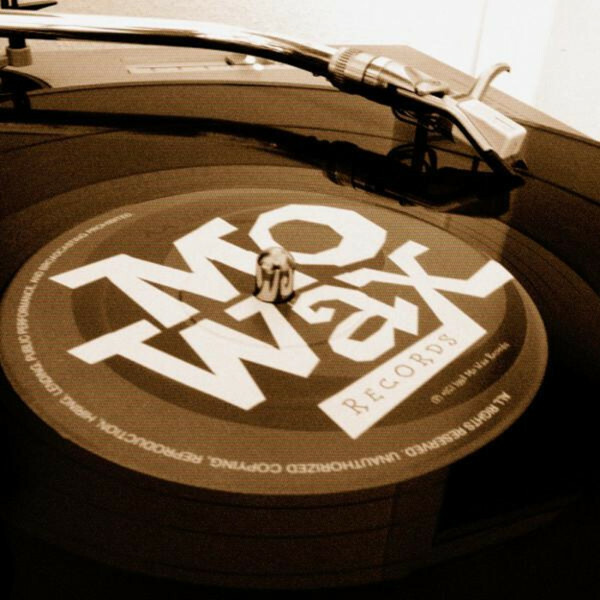 Such collaboration resulted in Mo’ Wax having a street identity rooted in the hip-hop sensibility of being FRESH. With the desire to pioneer, Lavelle pushed the art direction, resulting in elaborate and fetishistic packaging. Mo’ Wax differs in their approach in many ways from Factory/Saville who were more playful with the juxtaposition of cultural signifiers, and Lex x Ehquestionmark, whose best work revolves around repeated patterns and textures. Mo’ Wax, in contrast, created a subtle, nuanced, eclectic aesthetic, that was somewhat at odds with its founders’ love of hype. The most recognisable Mo’ Wax covers are the ones that use Futura 2000’s distinctive and elegant abstract graff. His paintings were used to fantastic effect on covers for DJ Shadow and DJ Krush releases. 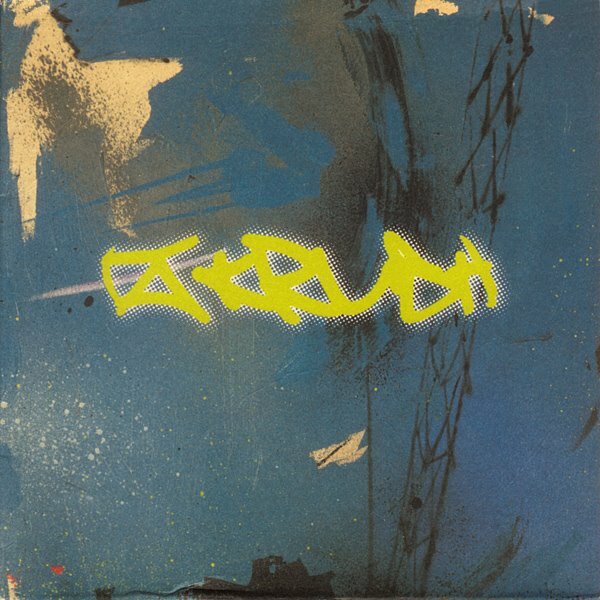 The Futura work wasn’t traditional graff that people were used to and the way it was appropriated made buying a DJ Krush 12inch akin to buying a super-nice art print. Likewise the hip-hop record it was adorning wasn’t like any hip-hop the buyer had heard before. There was little MCing, for the creators and listeners it was all about the beats. In this sense the unusual artwork was complimenting the leftfield sound. DJ Shadow’s Endtroducing LP is a standout cover. 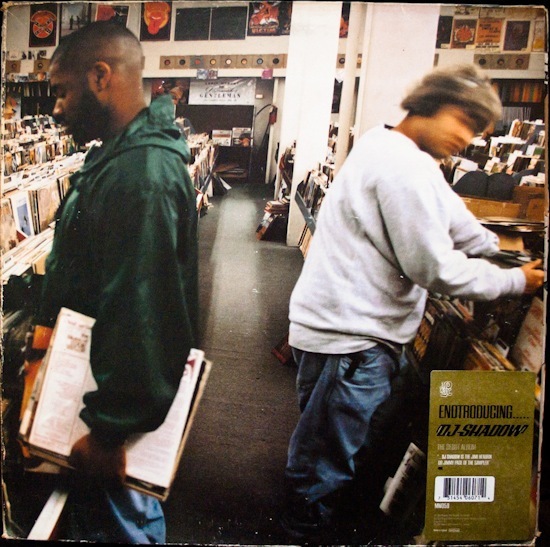 Endtroducing is a genre bending release an instrumental hip-hop record that confounds expectations. The artwork is a documentation of where DJ Shadow was and what the record meant. The iconic front cover photograph features crate diggers in a massive record shop. It is a snippet into the mythical world of sampling and vinyl addiction. Other design masterstrokes include the artwork for Attica Blue’s self-titled album and 3ree (Means to Be) single, crisp, self-referential, playful design. The Headz artwork, with 3D’s visceral daubs — a synergy between design, the releases title and the whole ‘heads’ vibe the Mo’ Wax scene was about — and the handcrafted typography was hip-hop in delivery but removed from cliché, is also worth looking out for. 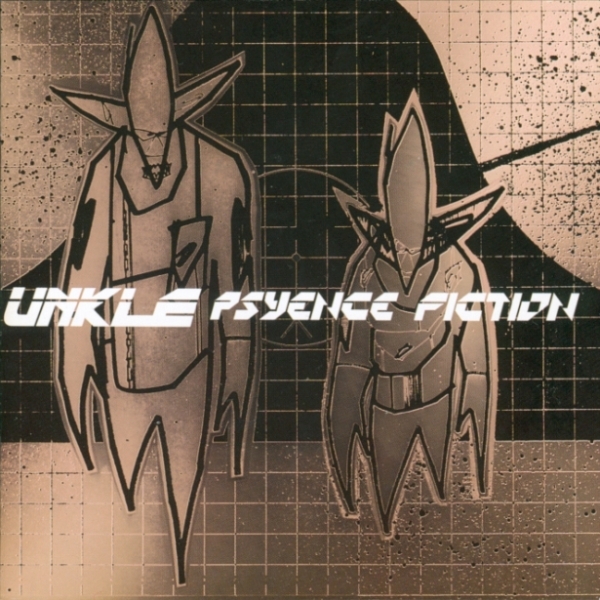 Likewise the packaging took a life-of-its- own life; the intricate UNKLE Psyence Fiction pop up, the limited edition Major Force yellow vinyl, the elaborate packaging for the Money Mark’s Push the Button LP, plus wonderful bespoke work just for promo items. The list is of innovation is endless. Today, when record companies are losing the battle against digital competition and marketing budgets are being cut, it’s unlikely, with a few exceptions such as Lex, that we will ever see such indulgence again. Mo Wax was your first design job after University, how did that come about? GB I moved to London and failed to get into St Martins. I was working in a restaurant and spending wages on records and began noticing the stuff Mo’ Wax were doing. I got into early DJ Shadow and followed up with Urban Tribe and Attica Blues. I liked the handwritten typography that was being used. Ben Drury’s artwork seemed self indulgent, communicative and good. I ended up studying graphic design at Camberwell, my tutor was illustrator Ian Wright (who is well known for his portraiture) and we used to talk music instead of doing graphics. Ian gave me Ben’s number but when I gave Ben a ring, he’d never heard of Ian… I asked Ben if I could show him my work and went down to the South London studio. My body of work was made up from lots of sketch books with ideas for type and weird stuff I had done making designs for fabric and costumes. For Ben everything started with a sketch, he loves drawing and I guess that was a common bond between our work. The Mo’ Wax set up then was? All seriously talented heads. All knowing about music, fashion.. they were just supercool. There was James (Lavelle) caked in BAPE. A catalyst, James was into creating his own identity but at the same time went against the grain of that scene a bit. Some heads were into the exclusivity of clothes and music, but with Mo’ Wax he was wanting to share what he was hearing and seeing. Likewise he is a great enabler, great at putting people together to make amazing stuff. The last time I saw him was in the studio making Never Never Land and we had lunch. I went into the next room and there was Jarvis Cocker and Brian Eno. Other memories are having dinner with David Axelrod and going to Fabric to see Ian Brown. Amazing perks you get from working at a label! Then there was Ben in charge of the art direction and the reason I was attracted to Mo’ Wax. Toby, the manager, he put everything together. 0llie, a professional skater sponsored by Heroin, who was sorting out the toys and the arts side. Will Bankhead, a fantastic photographer and designer. Will worked on his own stuff and the more expressive artwork for Malcolm Catto, Now Thing, and Jordan Fields etc. Will showed me that it’s better to take risks and make mistakes. He also showed me how to turn multiples of the same promo items into something better at the record exchange shops! What was the art direction at Mo’ Wax? What did you try to achieve with each release? Ben’s personal ethos was never repeat. He didn’t want to use the same typeface twice or approach two different jobs the same way. For example, the UNKLE typeface could be used again on future releases as it’s the brand, but for Ben it’s got to evolve. The next release has to be better, the design pushed as far as it can. So everything for the records would have to have an original typeface or image. We could never use a Futura painting the same way. We would have to use it differently and go down a road that we hadn’t gone down before. It was funny, I would have my college design rulebook and Ben would smash that out of me.. Instead of using the computer to line something up, he’d get me to do it by eye. This rejection of the easy option was repeated in many ways. For instance, sometimes it seems like your first idea is the one you want to go with and plough all your energies into that and you don’t look beyond it. For Ben your first idea was the start, the finalised piece was another ten ideas down the line. 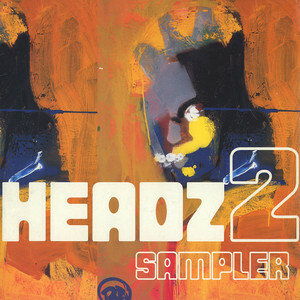 The Headz artwork is the one in which I first saw the hand written type. That was either Andy Holmes (of Holmes and Silas) or Ben’s writing. It looks like it’s done off the cuff, but it is hand-written and meticulously crafted. How did the relationship with Futura work? When I did the covers for the Nigo singles, Nigo had bought the images from Futura. It was pretty much the same for the other stuff. We would have a record that would need artwork (as in an image for it) and then James would get the label to buy the required Futura work. If you went to James’ house it was like Tom Hanks’ place in ‘Big’. It was littered with artwork, toys, clothes. An amazing place. 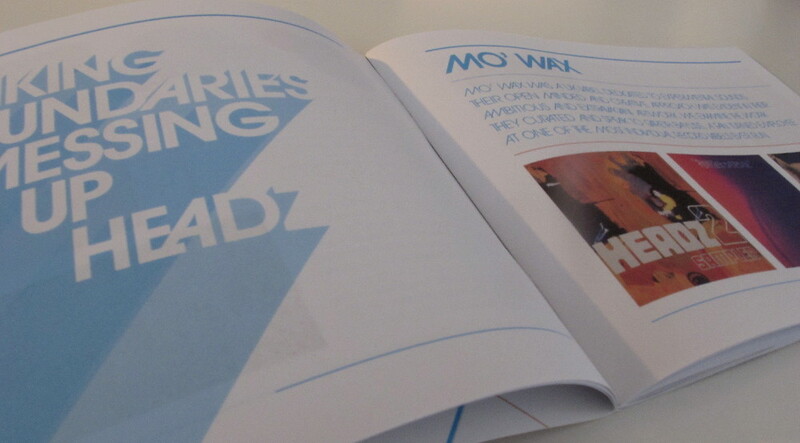 When I was beginning at Mo’ Wax they were working on the Futura book and had all these spreads on the floor. The book is like a visual guide you just dip into. It’s like a piece of art and a wonderful thing. I remember Ben went through about ten different versions of the front cover because the printer couldn’t get it right. I actually got Futura to sign my copy of the book, then Ben told him who I was which was a bit embarrassing. As a designer at Mo’ Wax, you blurred the lines between designer and artist. As someone who is both, do you think ultimately there is no difference between the two disciplines? I think design is about communication. It’s about using tools to communicate. Being an artist is more about being indulgent, ambiguous and experimental. But at Mo’ Wax can it be argued that things crossed over more? No, communication and graphic design are very different to producing art in my opinion. At Mo’ Wax it was about dealing with technological advances such as using Illustrator for type purposes and pioneering ways of translating ideas but at the same time getting the right message across and come up with the goods. What have you been up to post Mo’ Wax? Yeah, the Maths and English artwork is fantastic, the idea of mixing letters and numbers came from a Movement poster I think. They did Showtime in-house due to costs, invoices on the first might have been too heavy… The work Ben did for Maths and English is where I would have imagined we would have got to with the first LP if we have had more time. Ben’s at the top of his game with that one. Quite a varied amount of stuff and I have lots of random insights into the creative world… One of the benefits of working at Mo’ Wax was the sick portfolio and relationships I’ve built up. I had a short stint with the design team at Fabric. They are headed up by John Cook and are a true collaborative outfit. I would see things like John dressing up as a Cavalier and then getting people in the office to photograph him, they would then send the photographs to an illustrator to draw. John would collect old books and obscure visual references and store them for when they needed them, which is something I am prone to myself. DJs buy vinyl, artists buy images, which I guess is due to the fact that we appreciate something that’s created. I also did stuff with Damon (Deadly Avenger) and Illicit records. Damon has an amazing ear for music, this may or not be explained by the fact that he has no sense of smell. We took some great road-trips when he was DJing, it was all very juvenile. He’s working on film scores now. I worked on The Rapture’s Echoes LP with Trevor Jackson. The work turned out super nice but it was an exhausting experience. I was using a crap Mac and at the time was of my depth with Photoshop. Trevor wanted me to type the sleeve notes in Helvetica then run the work through a TV, photograph it and then scan it and put it back into Photoshop. A definite labour of love! I’ve also done lecturing in Leeds and Southampton. Now I’m working at a signwriters which is a great way to push processes and experiment with vinyl lettering. Outside of work I’m really enjoying experimenting with my own clothing label, Traveller. I produce all the stuff myself. The T-shirts I am working on at the moment feature wooden guns and tanks, they are all hand-drawn, as is the typography. I love drawing – it’s the effort that goes into creating an image that I really get a kick out of. I love seeing hand-drawn work that looks like it’s taken ages to do. It’s official : Mo’ Wax is back!